The phrase "one stop shopping" may sound a little corny, but we think it packs a lot of value in three little words. If you're already a fan of working with a full-service printer like us, thanks! You know how this makes your job easier. You work with one contact. There’s only one person you need to deal with, not a different one for every type of product you need, or for every phase of one particular job. By working with one contact at a full-service printer, you always know where your project is. There’s no anxiety about your job bouncing from printer to mail shop to fulfillment house. With one printer, you have a lot less paperwork. There’s one invoice, one person to communicate with, one company who’s responsible for your job. Your job’s much more streamlined, from planning, to prepress, to production, to post-press, and on to mailing and fulfillment. There’s no stopping and starting from one function to the next. No loss of momentum. No loss of momentum means no extra time is needed to package your job and ship it to the next company for finishing or mailing or fulfillment. Your job will be finished and delivered faster. Usually there’s a cost savings as well when you work with a full-service printer. There are no extra freight charges for shipping your job from one company to another. One company that handles all of your graphics needs will be familiar with your color requirements. Imagine having a complex campaign involving offset as well as digital components, banners, maybe even stationery. Employees of one company are cross-trained: they’ll make sure your color expectations are met. With one team handling your work, quality control measures are upheld from beginning to the very end, no matter what printing process is used. There’s only one team involved. This may be the biggest benefit of all. Having one team familiar with your organization and your print-related needs means your materials are managed and produced by a consistent workforce – one that works together daily. They interact constantly. There’s loyalty, and there’s professional pride. Since 1985, we've worked steadily to make Print-Tech a premier, full-service print provider. 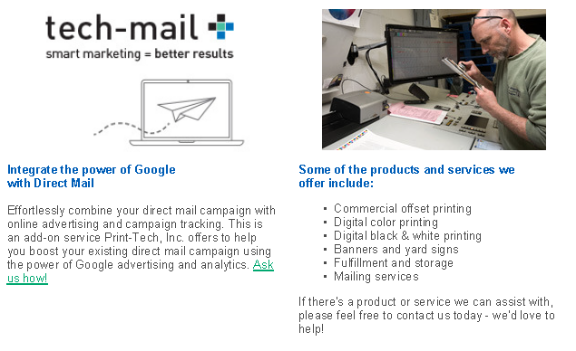 By offering you a full range of services, from all types of printing to mailing and fulfillment, large-format items, and high-quality advertising specialties, we take pride in helping you produce whatever you need.